Sticks with vitamins & minerals | mcePharma s.r.o. - Czech company operating worldwide, developing, producing and selling unique food supplements, pet supplements and cosmetics - mcePharma. Orally soluble powder in sticks - innovative line of food supplement especially developed for people and children who don‘t like swallowing of tablets and capsules. Orally dispersible sticks are revolutionary advanced dosage forms that improve administration of medicaments and dietary supplements. They are characterised by contained soluble powder or granules, which is dissolve quickly, while leaving a pleasant taste in mouth. This administration approach ensures rapid release of active ingredient immediately in mouth and direct absorption in mouth or in pregastric area (esophagus). This property provides high efficacy of active ingredient by removing the unwanted first-pass effect, process in which is active substance degraded in the digestive tract and liver. These sticks are advantageous for easy administration, high efficiency of administered dose and with rapid onset of effect of active ingredients. 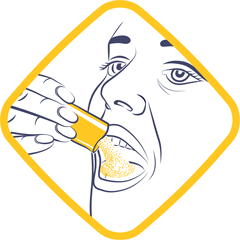 They are also perfect for children, elderly people and generally people unwilling to swallow a classic tablet.